A few years ago, I attended a taping of the Martha Stewart show and one of her guests was the author of The Foodie Handbook. The book wasn't that great, in my opinion, but there was one thing that was said in the beginning…that everyone who claims to like to food should have a roast chicken recipe! Growing up, my mom would roast a chicken about every 2 weeks. She would get a much larger bird than we needed for our family and after dinner was done she would pick that carcass clean and use the leftover chicken in soups (like my easy chicken and dumplings recipe) or enchiladas or just turn it in the chicken salad. We always looked forward to the smell of that bird roasting in the oven. It would just fill the whole house with that warm and comforting smell! The best part is – buying a whole chicken is relatively cheap! I can usually find a roasting chicken for about $1.29/lb or as low as $0.99/lb (and when I find them this cheap, I will buy several of them and freeze them!). The root vegetables are among the cheapest available and even lemons aren't that expensive right now. If you have an herb garden, you can grow your own seasonings. I tend to kill any indoor herb gardens that I have ever started (except Rosemary), so I usually just use Herbs de Provence. Remove neck and giblets from inside the chicken and discard. Rinse chicken well inside and out and pat dry. Mix butter and 2 Tbsp Herbs de Provence together. Season the inside of the chicken with salt and pepper. Insert 2 sprigs of rosemary. 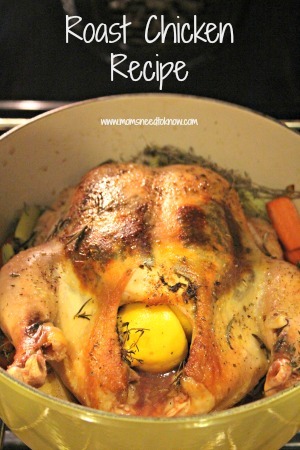 Squeeze 1 of the lemon halves inside the chicken. Place the other half of the small onion inside the chicken, followed by the other half of lemon. Remove from oven, cover with foil and allow to sit for 20 minutes. Once the meal is over and the chicken has cooled, make sure to pick all of the excess meat off the carcass for use in future recipes!